How did you end up working with children? QUESTION: How did you end up working with children and how did you know, or did you, that this was your career direction? ANSWER: I receive many variations of this question quite often so I thought it might be time to answer it by sharing my journey. I imagine that many of you wonder if working with children is the right path for you. The answer is actually very personal – everyone’s experience is probably very different. I did not set out to work with children. My work just evolved. I was the youngest in my family, so did not have the experience of caretaking a younger child. I was also not into dolls and other such “motherly” play. When I was about 14 I tutored an eight year old neighbor child in reading. She did not read at all (this was before learning centers and such). I remember sitting on our front porch one summer (in Cambridge, MA) telling her stories about each letter. I was pretty creative – even incorporating the letter’s sound in the story. Before long she was happily reading to the delight of her parents. How did I know how to do this? I have no idea. At age 15 (and three summers thereafter), I worked in a summer camp as a counselor. This was during World War II, and older people were making money working in defense plants or going to war. Only teenagers were available for these jobs. Some of my “kids” were only two years younger than I was. I loved this work very much and was delighted to go back each summer. I was very good at it and led a variety of activities: singing, folk dancing, swimming, drama, arts and crafts, and much more. When I started college I thought I might be a social worker, but working with children was not on my mind. An old college friend has told me that I used to say I wanted to be a child psychologist but would never be able to afford going through the long haul. I actually don’t remember this. After only one year of college, I married and left college to work in an office so that my husband could go to school. (This was very common in those years.) He actually became a social worker and we both worked in camps in the summertime for about three years. Then I was offered a job teaching pre-school. My oldest son was 2½ and went to school with me every day. I loved this work very much and found the children fascinating and wonderful. We moved around quite a bit, and in each city I was able to do some work leading groups of children in the Jewish Community Centers of each place in which we lived. I remember organizing a “Sunday Fun Day” where the kids did many kinds of activities every Sunday. Then we moved to California where I could go back to school easily wherever we lived. There was a wonderful early child development program at the city college I attended (along with a child development center that my youngest could attend). I spent one day a week at the Center, playing the guitar in each room with my 2½ year old daughter in tow. When I transferred to the state college, I decided to work toward a teaching credential in order to be home with my three children during school holidays. I did not like being a teacher. I did not like following a set curriculum. I taught fifth grade and first grade and did many unusual things with my classes in each of these grades. The principal once suggested that I “go into recreation” because I was so creative and wouldn’t follow the rules. (I could write another whole book about this experience and maybe someday I will!) The counselor of the school (at that time every school had a counselor) suggested I look into working with emotionally disturbed children – new classes were being formed. I did this and thought I found my calling. I even received a US Department of Education Fellowship to pursue a Masters in Special Education. During that time, I was asked to lead a group with children whose fathers were in a Navy sponsored alcohol treatment center, and I ended up leading this amazing group for two years. Unfortunately, life has a way of interfering. After several years of this work with various age groups, one of my sons, age 13, became quite ill and I took a leave of absence to be with him. I went back to work after he died with a very heavy heart. I shared what had happened to my son with my class of 12 and 13 year old emotionally disturbed boys and never had any difficulty with them, even though their former teacher had walked out in the middle of a school day, unable to manage them. Another sad event that occurred in my life at this time was the end of my 26-year long marriage. This is when I decided to leave my job with the school system and try my hand at private practice. But before I could get my license I had to go back to school since my transcript was missing some important classes. Eventually, I got my masters in counseling and received my license. During my internship I mostly worked with children due to my previous experience. I also started training with the Los Angeles Gestalt Therapy Institute and after three years was certified. I was asked to teach a class on working with children at the university where I got my masters degree, since there was no such class. I wrote a very long paper to give to the students, and actually this paper was a sort of outline for what would later become Windows To Our Children. By this time I was giving numerous workshops in the Los Angeles area and was often asked, “I’m a child psychologist, but ‘what do you do with the kid? !’” I decided I’d better write that book. Turns out it’s not so easy to write a book, as I’m sure many of you know, but eventually I entered a Ph.D. program that allowed me to write the book for my dissertation. The original publisher (Real People Press; the book is now published by the Gestalt Journal Press) asked me to take out all the Ph.D. window dressing, and he also removed a couple of theoretical chapters, which are now in my second book. So that’s how this work developed. I should add that when I was training and studying for my Gestalt Therapy certification (three years), I realized that none of the Gestalt books I had read wrote about psychotherapy with children. The theory, philosophy and practice of Gestalt therapy feels very organic to me, so I thought long and hard about how those would apply to children. Actually I was doing this when I was still working with disturbed children in the schools – they were my laboratory, so to speak. After the first book was published (in 1978! ), I traveled throughout the world and U.S. giving seminars. Windows to our Children is now available in 14 different languages – with more on the way – and is being actively used in many cultures To this day I receive letters from many people in many places sharing their excitement about how they are using this work with children and adolescents. Some of the people who have known me over the years think I work with children because of my own traumas. When I was five I was badly burned by boiling water and was in the hospital for months. When I was seven, both of my ears were operated on due to severe infections (leaving me hearing impaired to this day). When I was eleven I contracted diphtheria, the first case in Cambridge for over five years. When I was 17 my beloved brother, Arthur, was killed in the war. These traumas had a deep effect on me, and it’s true that I often wonder what it would be like to have had a therapist come to my bedside and help me express my feelings through, maybe, a puppet show. I think I would have loved that. And so perhaps these people are right, at least on some level. So this is my journey that led to the work I have done all these years – and continue to do. Now that I’ve shared this, I wonder…what has your journey been like? 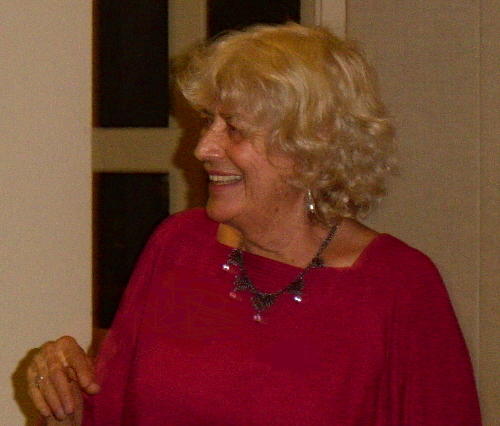 Dr. Oaklander taught at the last Evolution of Psychotherapy in 2009. Her lectures were jam packed, but more important, were full of the very special passion, joy, and expertise with children that has made Violet and her work so widely used and treasured all around the world. BOOK SIGNING: Violet will be signing copies of her books, Windows to Our Children and Hidden Treasure, A Map to the Child’s Inner Self on Friday night, December 13th from 6:30 to 7:30 PM. WORKSHOP: Violet will be teaching a workshop titled: Gestalt Therapy with Children and Adolescents on Saturday afternoon, December 14th from 2:30 to 5:30 PM. INVITED ADDRESS: Violet will be giving a one hour address titled “What Brings Children into Therapy” on Sunday morning from 8 to 9 AM. In addition, the Violet Solomon Oaklander Foundation will host a booth throughout the entire conference featuring many resources for using the Oaklander Method of psychotherapy with Children. Violet enjoyed spending time at Foundation booth in 2009 and meeting people from the conference in between her presentations. Almost every day Violet gets emails from across the US and around the world. Violet’s book, Windows to Our Children, has been translated into 14 languages. One of the best selling translations is the Spanish version. Her recent second book, Hidden Treasure, has also been translated into Spanish. We thought we’d share this letter sent to her recently by a therapist in Panama. I have discovered your books through my mentor and I can’t thank her enough for introducing me to such a wonderful, compassionate, inspirational and professional therapist and human being as yourself. The lessons I have learned throughout your books about being a more present and thoughtful therapist will forever be cherished in my heart. Being from Panama, it is rather difficult to find good books about how to be a child therapist, and your words have not only inspired me to take better care of our wonderful patients, but also to look within myself in hopes of becoming a better person as well. I’m currently studying my masters in Child and Adolescent Clinical Psychology and both your books have been a breath of fresh air for me. You write from such a personal and true place, it is difficult not to be marveled upon by your approach in therapy. So for this, I thank you. Your stories and cases not only strength my work and carft, but also enrich the way I relate to these children, and hopefully help them to discover who they really are. Thank you for sharing your wisdom, it is when I read about people like you that I feel most connected with being a psychologist and most grateful to be allowed to what I love the most: bring out the best in children and adolescents.